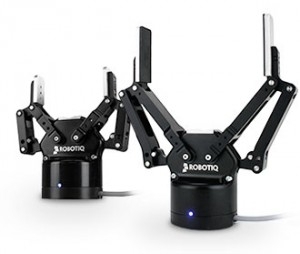 Compact and flexible this 85 mm or 140mm of stroke 2-Finger Adaptive Robot Gripper has been designed to give industrial automation the flexibility needed to automate processes including a high-mix of parts. Fully programmable, this robotic gripper can handle a wide variety of parts through three distinct gripping modes: parallel grip, encompassing grip and inside pick. High payload to weight ratio. Long stroke with compact form factor. Full control on fingers' position, speed and force. Compatible with all major robot manufacturers. Communicate with robot controller over: Ethernet/IP, TCP/IP, DeviceNet, CANopen, EtherCAT, Modbus RTU.